Capture course conditions while on the course using a mobile app or identify issues on drone maps. 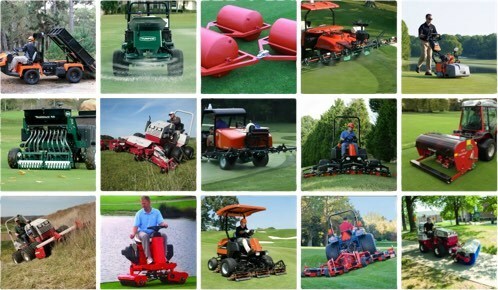 Manage golf course maintenance teams, and track issues, machinery & club house assets. Data is projected onto drone, satellite, and CAD maps. 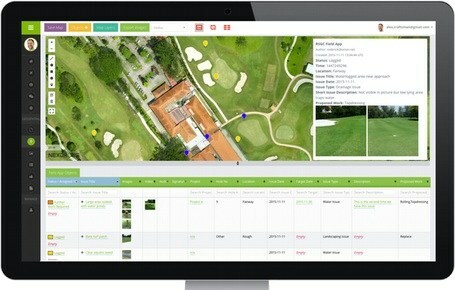 Manage your golf course efficiently with GolfGage! Golf course maintenance is changing rapidly with the emergence of mobile devices, sensors and cost-effective drones and mapping tools. GolfGage will help you take advantage of these technologies to monitor the condition of your course, clubhouse and machinery. GolfGage facilitates sharing & updating work records with your team. In times when water consumption and efficiencies become increasingly relevant it is imperative to identify, track and solve issues as early and with as much information as possible. What does the Mobile Maintenance App do? Our Golf Maintenance App allows to record & monitor course relevant issues, assign maintenance tasks to team members and track their work progress. Issues can be recorded with the App while walking the course or through a map based interface using satellite, drone and CAD maps. GolfGage can also read and display IoT sensor data via its API. Your team will update you on their work progress and provide images to keep you in the loop. With GolfGage you always have a complete overview on the current condition of your course. Is GolfGage similar to DroneDeploy or Pix4D? GolfGage imports the maps you generate in DroneDeploy & Pix4D and allows you to use these to display & visualize your course maintenance observations & records. Maps can also be used to identify issues directly, e.g. invasive turf patches and wet areas. You can also apply filters to imported NDVI maps to highlight problem areas. Once you’ve identified an issue on a map you can generate a work order, e.g. spraying fungicide, or request a more thorough ground inspection to add ground images and further details to that work record. What map formats is GolfGage compatible with? You can import maps to GolfGage or import them directly from selected web applications. This way you can use the software tools you are most familiar with and then upload the outputs to GolfGage. We fully integrate with DroneDeploy allowing you to upload maps straight from their website to GolfGage. GolfGage also accepts GeoTIFF, MBTiles or non-georeferenced PDF and image files (PNG, JPEG, etc.) which can then be georeferenced directly in GolfGage. No worries, we developed a simple georeferencing tool that anyone can use. Why do we still need to visually inspect a Golf Course? Golf Clubs, Parks and Resort facilities face hundreds of small issues around their course or property. Tracking these can never be achieved entirely from the air. That is why GolfGage is build around the concept of ground truthing where information gained from aerial maps is supplemented with detailed case records as seen from the ground. GolfGage has designed a Geospatial FieldApp that allows you to track all issues and records related to maintenance in a simply beautiful app. If you already use WhatsApp to share course observations then you’ll love GolfGage! Do we need to know how to operate a drone? No, GolfGage works perfectly without drones and it comes with it’s own google-like set of satellite and street maps by default. Every club usually has some mapping materials such as aerial maps, satellite maps, CAD drawings highlighting different systems installed (irrigation & drainage network). GolfGage will make it easy to add these to your workflow. And if you are using drones to map out and monitor your course you can import these as well to visualize & monitor course observations and compare maps to spot changes over time. Schedule a demo with our team and learn why hundreds of clubs are already using GolfGage. Experience our solution first hand. Our drag & drop Form Builder allows you to build, distribute and manage customized, lightweight geospatial apps across standard mobile devices. All without the need for specialized hardware, software or training. Replace all your paper forms while keeping your golf course management methodology and expand it with a powerful location data collection tool. Add photos & videos to your records. Link assets using barcodes to records. Collected data can then be visualized in interactive tables and maps. MANAGE YOUR GOLF MAINTENANCE TEAMS, ASSIGN TASKS & GET INSTANT FEEDBACK ON WORK DONE. GolfGage mobile forms include powerful status and scheduling options, making them adaptable to any methodology you might apply in managing your golf course. Collect issue records in the field, schedule maintenance work orders, dispatch golf course maintenance teams to a specific issue or location and receive instant feedback through mobile devices. This ensures that you can close the loop on cases and issues and manage teams and assets with confidence. Overlay your mobile golf course data on satellite maps, drone acquired maps, turf health maps (NDVI) or even building & surveyor plans (CAD drawings) to better understand the context in which your data was collected. For example, overlay irrigation and drainage plans over your drone maps to make informed decisions while inspecting the course. GolfGage includes a full fledged map system that can process drone acquired data as orthomosaic, elevation and NDVI maps. GolfGage also includes a geo-referencing module to anchor CAD drawings such as floorplans on top of drone and satellite maps. Visualize your golf course records and map data in a shareable, collaborative geospatial portal. Spot patterns, analyze differences and use these insights to make the right decisions. Dispatch your course maintenance teams to work on issues and report back. Manage your teams by adding and removing team members. Create Reports using the collected golf course records. Edit your existing forms on the fly and create new forms as needed. Track the condition of your machinery with GolfGage. Maintenance staff can highlight machinery issues to the course mechanics. The mechanics can mark machinery as ‘being repaired’ and inform the maintenance staff when the equipment is expected to be available again. This is important to plan future course maintenance tasks. Track spare parts needed and forward detailed reports to external contractors or equipment manufacturers for repairs. GolfGage can be used to monitor any type of asset including buildings and indoor facilities. Just upload your club house floor plans and start tracking club house related maintenance issues too. Never lose track of all the small improvements & repairs needed to keep your facilities in perfect condition. Does your organization fly drones or hire drone pilots to create maps? GolfGage works with any drone acquired images as long as you can ensure they overlap enough to process a map. With GolfGage you just need to upload your drone acquired images and we will process them for you. We also offer golf specific drone sets that combine easy to use off the shelf drones with NIR cameras that will allow you to monitor the health of your turf. Just get in touch with us to know more. Does your golf course use weather stations, irrigation control systems or soil moisture sensors? GolfGage comes with an API and upon request we can import any sensor data and add it as a separate layer on top of your drone maps and mobile acquired course data. GolfGage is also fully compatible with Bluetooth Low Energy beacons such as Eddystone beacons that are increasingly used for weather stations or soil moisture sensors. View all your golf course sensor data right in our GolfGage geospatial portal. MapGage helps companies collect and manage geospatial data, visualize collected data on top of satellite or drone maps and take actions with it’s unique location based mobile process flow builder. Field teams are sent to specific locations on a map with detailed case instructions and can report back their findings and work results to a map based company dashboard. Copyright © 2017-2019 Geo Data Intelligence. All Rights Reserved.